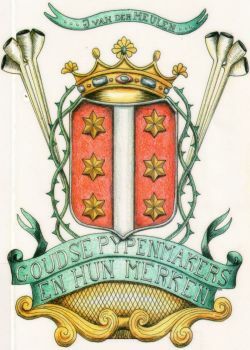 Browse the digitized version of 'Goudse pijpenmakers en hun merken'. It contains information about the history of clay pipes and the development of clay pipe shapes (in Dutch). Author: J. van der Meulen. The original is published by 'de Pijpelogische Kring Nederland', Leiden and 'de Stedelijke Musea Gouda'. This internet publication has been permitted by the author. Note that commercial use of image and text content is not allowed without written permission.